Very recently this author was immersed for three days in the world of the aesthetics of design. Dieter Rams’ name came up. Deiter Rams worked as Braun’s chief designer, having a desk there from 1961 to 1995. It occurred to me that I agree with the whole lot of Rams’ principles which are opposed to zany, aggressive styling and yet I am a known liker of cars such as the Nissan Juke and Toyota CH-R.
People will also know of other zany and aggresssive designs which offend to a degree and I don’t dislike all of them. I have come to accept some zaniness is quite okay (maybe it’s resignation). Is there any way I can find a way to resolve this mess of contradictions. Can I agree with Rams and like things like the Juke? Is there a mess of contradictions at all? colors and forms and the entertainment of form sensations enlarges the world’s chaos,” wrote Rams in 1984. Please could you be so kind as to allow me to move past you? When juxtaposed, it’s not hard to see the 1990s cars as conforming very much to Rams’ ideals. And the A6 is still a fine car to look at today. You can only call the later car very assertive, aggressive and pushy. Without wanting to dodge criticism, can we allow that if the Juke is not the last word in simplicity, it is not aggressive. You may disagree. That isn’t going to pass any part of Deiter Rams’s social contract view of design, I have to admit. …which car is very much erring on the side of overly busy and aggressive around the snout. The lesson to designers is to ease off on the frowning, glaring front end and tidy up the flanks somewhat. Think of it as a design challenge. Post-Script: Dieter Rams was another of the German designers from the Ulm School of Design. The retirement of this generation of designers has opened the way for a new cohort who are reacting against the calm shapes preferred by their predecesors. Or else the demand for busier shapes from newer markets has not been resisted. 1. Good Design Is Innovative : The possibilities for innovation are not, by any means, exhausted. Technological development is always offering new opportunities for innovative design. But innovative design always develops in tandem with innovative technology, and can never be an end in itself. 2. Good Design Makes a Product Useful : A product is bought to be used. It has to satisfy certain criteria, not only functional but also psychological and aesthetic. Good design emphasizes the usefulness of a product while disregarding anything that could possibly detract from it. 3. Good Design Is Aesthetic : The aesthetic quality of a product is integral to its usefulness because products are used every day and have an effect on people and their well-being. Only well-executed objects can be beautiful. 4. Good Design Makes A Product Understandable : It clarifies the product’s structure. Better still, it can make the product clearly express its function by making use of the user’s intuition. At best, it is self-explanatory. 5. Good Design Is Unobtrusive : Products fulfilling a purpose are like tools. They are neither decorative objects nor works of art. Their design should therefore be both neutral and restrained, to leave room for the user’s self-expression. 7. Good Design Is Long-lasting : It avoids being fashionable and therefore never appears antiquated. Unlike fashionable design, it lasts many years – even in today’s throwaway society. 8. Good Design Is Thorough Down to the Last Detail : Nothing must be arbitrary or left to chance. Care and accuracy in the design process show respect towards the consumer. 9. Good Design Is Environmentally Friendly : Design makes an important contribution to the preservation of the environment. It conserves resources and minimises physical and visual pollution throughout the lifecycle of the product. 10. Good Design Is as Little Design as Possible : Less, but better – because it concentrates on the essential aspects, and the products are not burdened with non-essentials. Back to purity, back to simplicity. Dieter Rams’ work expresses an HfG inspired school of thought that is also found in the work of Gugelot or frog design (Seventies’ Wega TV sets) or in Otl Aicher’s pictograms. Design is perfect when you can’t take anything away without destroying the function and when you can’t add anything without destroying the looks. One of the last cars that expressed this school of thought was the Golf IV which to my eyes is an absolute masterpiece of German industrial design with very few weak details like the over decorated headlights of some models. Might I suggest the Jetta of the same time is an even better candidate? If we have learned something here at DTW it is that there was a strand of design leading from the Bauhaus to the Ulm School to various German manufacturers. It reached its zenith between the 70s and 90s and has now expired. I can see why there was no British counterpart. Why was there not a French one as the French were very keen Modernists. Maybe some research is called for to see if there ever was a particular French design ethos. Italy is too fragmented to have a corresponding arrangement. The Bora/Jetta Mk4 was remarkable because it differec much more from the Golf than its predecessors. In return it lacked the stroke of genius of the four door Golf where the shutline of the rear doors’ trailing edge runs parallel to shutline and panel gap of the hatch, rear light and bumper. This style of work is lost in current German cars but it lives on in German industrial products like machine tools. I do not know whether there is a historical line connecting Bauhaus and HfG because HfG became famous more for the contract work of its lecturers and students than for the results of the institution itself. HfG was famous for its web of internal intrigues and personal hostilities and for not delivering on promise, never mind the permanent open conflicts with the local Conservative government that only waited for an opportunity to shut down the whole thing. But they had bright minds like Hans Gugelot and Dieter Rams and they did timeless designs like Ulm tableware, brAun design or Lufthansa corporate ID. Lufthansa’s cID is currently suffering the same fate as German car design. Good morning, Richard. Thank you for an interesting piece which neatly captures the regrettable direction in which automotive design has moved over the past twenty or so years. As an interested observer with no formal education in design automotive or otherwise, I find myself wholly in agreement with Dieter Rams’ principles of good design. That said, there should be some wriggle room allowed for playful, adventurous diversions. I think the Juke is a good example of this. The Mk4 Golf and its Jetta/Bora derivative are brilliant examples of Rams’ principles and, as a consequence, both still look fresh and modern today. I would volunteer Audi’s B6 generation A4 and C6 generation A6 as similarly good examples, representing the high water mark of Audi design, from which the company has fallen greatly. It would be an interesting exercise to critique current production cars against the Rams’ principles. I suspect very few would pass inspection. Volvo would score highly, as the company ethos is diametrically opposed to “agressive” design. Which company would be bottom of the rankings? Hi: thanks. Indeed there should be some room for playfulness. The Italians did some colourful and cheerful products which also had an enduring quality to them. I am very sympathetic to Rams´ ideas but he was a bit severe when it came to colour. He would not like a food mixer to be presented in a bright colour. I could imagine such a device standing out as a feature of a quiet kitchen landscape. Rams´ (I am guessing) probably didn´t drive a brightly coloured car either. It´s worth pointing out that the architectural norm in Europe was for colourful buildings. Tradition isn´t everything but for centuries people lived with a colourful urban environment (unified by the structure of streets). So, it´s not as if colour is intolerable. Perhaps industrial colours are harder to bear when used extensively. There´s no formula. Context matters. What we might see soon is a turning away from very busy shapes with a lot of strakes. Some recent Mercedes are getting there. There´s a very smooth coupe that they make which may not be within sight of their best but is still quite acceptable. Their product proliferation is so great that I can´t recall the name of the car. I will have to go off and Google it…. It´s the C-Class coupe. Volvo are more down my street too, except for the horrid cross-over thing. I had to Google that as well: XC40. Apart from Volvo, quiet design is to be found here and there in model ranges, one car at a time. Thanks for this interesting piece, and Daniel’spost above, which I think most of us here will agree with, in general, with a few small divergences: Juke 1: fine; facelift: not so much. “the demand for busier shapes from newer market…” This is the problem. Everywhere has, socially, got more individually competitive. No one seems to care that what was once derided as a genital extension has become acceptable as a mainstream must-have. All are being pulled towards the world’s biggest markets, in E Asia, also the keenest to replicate what looks like 1950s USA. I suppose it’s “the narcissism of minor differences”. On those non-brash Audis: yes, you see instantly what the product is. What you can’t see is how it performs its main purpose — transport with driver ease, passenger comfort, safely etc. The lack of French and Italian IDs might be due to the tax systems. Cf the 2CV and Fiat 500s after the war — and Lancia ignoring that entirely, as their rich buyers possible avoided paying it. I wasn´t thinking of large cars so much as a particular school with a geographic base. Bauhaus and the Ulm HfG were from southern (ish) Germany and had continuity of personel. There must have been Italian and French schools of design. They didn´t have deep impact. Stephen Bayley once made a gnomic reference to the influence of the medieval theologian Meister Eckhart on German design (in Car magazine, it may have been). Any link from Eckhart to the modern time runs via the 19th century Romantics and will have to be explained further by Bayley himself. I can´t see any direct relation between the theology and the shapes . I have no strong idea what lies behind the moral/aesthetic drive of Rams´ and others. It has no parallel on other countries. Ruskin in the UK was just offended by waste which is a form of stinginess if not moderated by other values. Richard, that unquiet XC40 is the best-selling Volvo around here in N France, I’m afraid. Yes, the XC40 is the least well resolved of Volvo’s new range. Two things stand out as unsatisfactory to my eyes. The first is the bonnet shut line to the front wing, which looks rather wide and ends abruptly at the front door. Why they chose a clamshell bonnet when there was no corresponding crease along the bodyside is beyond me. The execution looks very poor. Take a look at the current Audi A4 for how to do this properly. The second problem is the uptick to the DLO in the rear door. 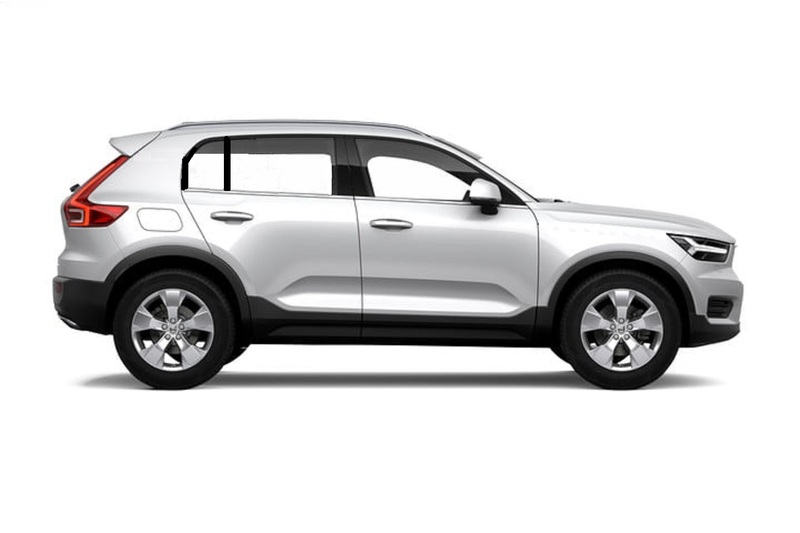 This is a current design clichè, which looks particularly awkward and contrived on the XC40. It must make the rear seats rather dark and restrict the view. It’s a shame Volvo felt the need to distinguish the XC40 in this way. The XC40 must be another car in the would-have-been-a-coupe class. Those thick C-pillars were very much a coupe characteristic along with the small rear accomodation. Volvo really didn´t need to do a car like this. It would have been more honest as a raised five-seat hatch with nice big rear windows. Both the Juke and CH-R are five door hatchbacks yet they offer rear seat passengers a very bad deal in terms of space and light. Therefore, they are failed designs in my book. Being ‘distinctive’ is the easiest trick in the book. I’m not at all impressed. Conversely, I saw a few Volvo XC40s on the road this summer and was impressed. And I would much rather travel in the back of one of those. The CH-R is a coupe with five doors. I see these cars as serving what was once the two door coupe market. They have been given two extra doors because people think they need five doors. The CH-R is not a coupe. All the advertising and market positioning work in the world will not make it so. Not particularly imaginative on my part, but sometimes simple is best. It now mire closely follows Rams’ principles. What do you think? It´s better than before. Try cutting the DLO back so it´s trailing edge is parallel with the rake of the rear screen. I´d also simplify the line of the black cladding on the underbody. It drops at the doors. I´d make it straight. Less is more. I thought about the DLO alteration you suggest, Richard, but was concerned it would make the C-pillar very wide, hence this compromise, somewhat reminiscent of the Kia Sportage. My intention in playing with the design was not necessarily to produce a definitive solution, but to explore why an apparently more obvious and rational alternative was discarded in favour of the chosen design. What does it achieve? Does it make the design more attractive, or merely more distinctive? Did Volvo feel the need to do this to appeal to a younger, more fashion conscious (as opposed to design literate) demographic with this model? I’d love to have been a fly on the wall during the meetings that settled on the chosen design, as it is quite un-Volvo. I’ll give your suggestions a go, although we’re already pushing the limits of my photo-editing skills and software. Incidentally, does anyone know of a really good free photo-editing app, either for Android or Windows 10? The rational choice is something like a -pillar with parallel or nearly parallel edges. That´s why pretty much everyone has done one like that at some point. Out of a desperate need to differentiate the new from the old less and less rational alternatives have been proposed: the huge ones as per the Volvo and Suzuki Ignis or chopped up stumps as per Citroen and Opel and Nissan (or Infiniti). The blunt answer is that all this detail and deviation from the rational is to do with attracting attention and product differentiation. It reflects the fact that there are few other USPs available that can be seen. The mechanicals are pretty much the same and you can´t see the digital tech from outside the car. I also eliminated the indent in the doors, to smooth out the profile further. The shape of the rear quarter-light was tricky. A pure triangle was too severe and rather incongruous, so I curved the trailing edge a little to soften it. It’s not quite right yet, but you get the idea. Overall, I think it still retains its essential Volvo-ness but is more timeless, if rather less “saveur du jour”. My C.V. is in the post to Gothenburg. Now that you´ve drawn my attention to it, I want to know what the clamshell bonnet is for exactly. Clamshell bonnets are used to meet pedestrian protection regulations. If you have a vertical panel gap between wing and bonnet you automatically have a very hard edge on the wing. If you have a bonnet reaching over the wing you can keep the edge of the bonnet very soft. The front wings on Audi’s B8-series A4s (which has kind of a semi clamshell bonnet) are no longer directly bolted to the wheelarches. Between wheelarch and wing there are Y-shaped support brackets that are bolted to the wheelarch and the wing is pop riveted to upward facing part of the Y. This makes for a very soft contact area, reducing the risk for pedestrians. With the full clamshell bonnet of the B9-series A4 Audi could omit most of these brackets and still have a soft edge on the wing. Dave: is that why Saab used to use them? At the same time, I notice plenty of new cars on my street with no clam-shell bonnets. And I notice that Opel´s Corsa “C”, the current Astra and Insignia have bonnet shutlines moved well sideways. I thought the fact the Insignia used it was a matter of corporate style, a nod to the well-regarded “C” but from what you say Opel have done some safety thinking. The first Laguna had the same feature too. Saab as well as BMW’s Neue Klasse and 02 most probably didn’t use clamshell bonnets for pedestrian protection. Maybe the Swedes took that as a welcome side effect but it wasn’t their primary consideration. Both companies used this type of bonnet because they wanted the hinges at the front so they could put massive catch hooks in front of the windscreen to prevent the bonnet from being pushed through the glass in an accident. Saab and BMW thought that hinges at the rear of the bonnet would shear off in an accident, allowing the bonnet to be pushed through the windscreen and decapitate the front occupants. Clamshell bonnets offer a soft landing surface for pedestrians without the need for expensive and troublesome mechanisms raising the bonnet with springs or explosives. For what it’s worth, Dieter Rams drove a silver-coloured Porsche 911. I’m guessing it was a 993 series; I say ‘guessing’, as I’m no expert on Porsches, as they leave me rather cold, fine vehicles though they are. That´s disappointing. I´d have put Rams in a black, metallic grey or white Mercedes W-113, W-123 and then W-124, all of them the mid-range engines. My imaginary Dieter Rams then recoiled in horror at the W-210 but he didn´t need to buy one because his W-124 was built for life. However, had he needed a new car for some reason, he would have switched to a Volvo S70 because the seating is so much better than the A6 of the day. After that came a Volvo S60. He didn´t like the 20010 S60 though – too flashy and convoluted. I think the imaganary Rams has simply hung on to the S60 Mk1 as he doesn´t drive so much these days. Dieter Rams used a 911 just because he found it the fastest way of getting from A to B. At least that’s what he told a journalist when asked for his favourite car. Dieter Rams designed some great products, but I think his “principles” are gratuitous and quite frankly, the pretentiousness of writing ten commandments infuriates me. Gratuitous is quite a charge. In what way are they gratuitous? If I have a problem with them it is that they do not allow for the ceremonial or special. His principles are good for daily life but miss any sense of the extra-ordinary. He is stating the obvious and most of what he says is hot air. ‘Good design is as little design as possible’, read that again… What I think is even worse, is that his “principles” largely ignore the complexity of design. Most designers better stick to their work and let others do the philosophising. “Good design is as little design as possible” means that one might want to be very careful about ornamentation and articulation. He probably doesn´t mean as little design-ing as possible. That is, he means the noun design not the verb design. In my experience a simple shape needs a heck of a lot of work to make it look acceptable. I feel that many in automotive design might want to review Rams´ suggestions. The architects are another matter. Maybe it helps when you look at what the German noun ‘Gestaltung’ (or ‘Formgestaltung’) means. Gestaltung has a strong technical/functional/engineering bias. Compare decorating finger nails to creating a house: both are ‘design’, but only the house involves ‘Gestaltung’ (at least we hope so). Gestaltung happens when form creators cooperate with function creators. Nowadays form creators talk to marketing people and as a result ‘Gestaltung’ makes way for ‘design’. Indeed, his ten commandments are as open to interpretation as those other ten and as usable to support any claim, idea or action. As written by the God of Design in the Name of Good Design this time, oh well. To reiterate my plea: let the man pen down great designs, instead of stupid rules. Is simplicity best? Or simply the easiest? Whilst I admire Rams theories, like life, it must be lived. The Juke I shy away from. The C-HR leaves me bereft. Give us not aggression; the highway is for freedom, not a battlefield.